Popular satirical news website ‘The Onion” has hired a financial adviser for a possible sale, according to Bloomberg. They’re apparently working with investment bank GCA Savvian. Bloomberg reached out to Steve Hannah, “The Onion’s” chief executive officer who wouldn’t comment on the situation. 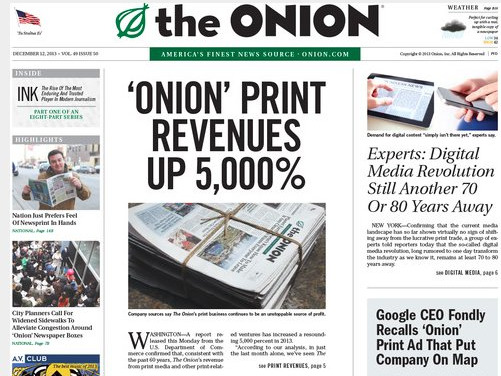 As Bloomberg notes, “The Onion” was founded as a magazine by students from the University of Wisconsin at Madison in 1988. Eventually they moved to digital-only, and their satirical news content is spread across several websites and YouTube channels. A fund manager, David Schafer, bought the company in 2003.